HSH Prince Albert II of Monaco Views a Unique Installation Exhibition in Paris. 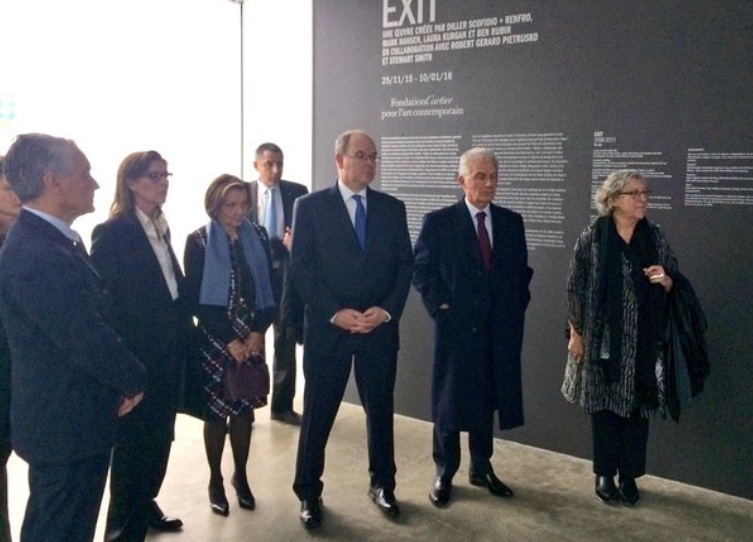 On Tuesday, December 8, 2015, His Serene Highness Prince Albert II of Monaco accompanied by Her Royal Highness Princess Caroline of Hanover arrived at the Palais de Tokyo in Paris, France, to view the unique installation exhibition entitled, EXIT. The exhibition, organized and presented by the Fondation Cartier pour l’art Contemporain, is based on a prompt set out by French philosopher and urbanist, Mr. Paul Virilio, whose experimental work was created by American artists and architects Diller Scofidio + Renfro in collaboration with architect-artist, Ms. Laura Kurgan, and statistician-artist, Mr. Mark Hansen, with a core team of scientists and geographers for the exhibition Native Land, Stop Eject in 2008, and is now part of the Fondation Cartier collection. EXIT is composed of a series of immersive animated maps generated by data that investigate human migrations today and their leading causes, including the impacts of climate change. Its complete 2015 update has been planned to coincide with the United Nations Climate Change Conference (COP21). Conceived as an artwork, EXIT uses geo-coded data that was collected from over 100 sources, processed through a programming language and interpreted visually. The work is a reflection on the notions of being rooted and uprooted, as well as related questions of identity, Native Land addressed issues that have continued to intensify. The current refugee crisis makes the 2015 presentation of EXIT more timely and relevant than ever. EXIT will be open to the public until January 10, 2016, at the Palais de Tokyo in Paris. Previous (VIDEO) TMs King Philippe and Queen Mathilde of Belgium Host a Reception in Brussels. Next HSH Prince Albert II of Monaco Receives the Médaille de Commandeur du Mérite Maritime.